DIY with your own hands, heart & head. About live & survival.... all knowledge to keep yourself simply alive. The Celts grew and knew a lot of cabbage. Their word ‘bresic ' was taken over by the Romans as brassica. Their stem words cap (head) and caul (strain) is found back in many languages ​​. 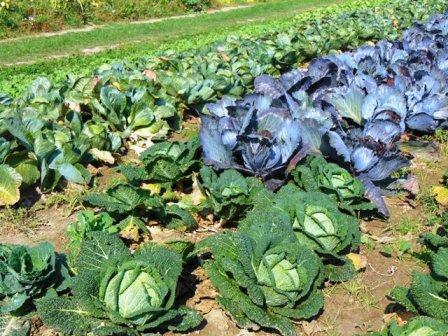 Most cabbage plants are biennial, and make in the second year seed. For centuries crosses of cabbage (and related) species made ​​an inextricable tangle. Also in textbooks may be different names point to the same types. And vice versa. 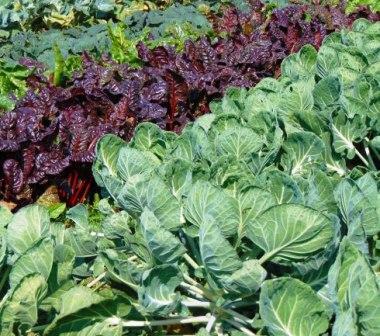 White, red and savoy cabbage are not that difficult to grow. They keep well. Savoy cabbage is partially hardy (to -15°C). For sauerkraut is usually white cabbage used. Red cabbage gets its color from anthocyanins in the epidermis (like copper beech, eggplant and red fruit). By combining complementary colors red and green, they sometimes appear blackish. Chinese cabbage and headed cabbage are more suitable for braising and salads. Savoy cabbages (Brassica oleracea var. Sabauda) can be distinguished from other species by their puckered leaves. And they have no (or less pronounced) wax coated leafs like red and white cabbage. In turnip cabbage (or kohlrabi, Brassica oleracea var.Gongylodes) is the thickened stem above the ground. In swede underground. Farmers (curl) cabbage supplies throughout the winter fresh vegetables for humans and animals. Kale, Brussels sprouts and broccoli are also available in a purple version. Brussels sprouts originated by a jump mutation around 1750, and was cultivated around 1785 near Brussels. The bitter taste of sprouts is caused by the presence of fenylthiocarbamide. They taste softens as it once has frozen, then the starch is converted into sugars. Sprouts air is caused by the release of volatile sulfur compounds, which is apparently the reason why many children do not appetite sprouts. Growing plants make starch. This is gradually converted into sugars that are used for the growth. In cold weather, the growth stops, but the conversion of starch to sugars goes on. Therefore vegetables like kale, palm cabbage, Brussels sprouts, parsnips and other types of carrots taste better and sweeter after it was freezing. Broccoli has several small, green flowers. After the harvest of the main button come from the leaf axils still harvestable side buttons. 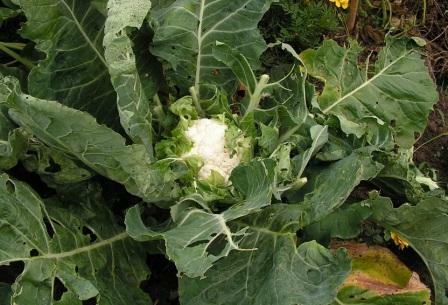 To keep the flower of cauliflower white you may have one or two leaves bend and fixed between the opposite leaf and the flower, without touching the flower with your fingers. That causes brown spots. Uncovered cabbage is indeed equally tasty, although a little yellow. Caterpillars (cabbage white) and clubroot are the most to fear plagues. Clubroot continues to survive in the soil at least 10 years. The cabbage fly overwinters in the soil as a pupa. Around mid-April, at a bottom temperature of about 15°C at 5 to 8 centimeters deep they come out. Their white eggs are about 1 mm long and are laid at the foot of the plant. The maggots are 1 cm long and shiny white. First they eat all the lateral roots off and then penetrate the taproot, with discoloration and decay as a result. You can prevent egg - deposition close to the plant with a cabbage collar. The maggot can only move a few centimeters and then will not make it. Cut pieces of cardboard, rubber, plastic, (pond) film, asphalt paper 15 by 15 cm. Make an incision to a hole in the middle. Make sure that the stem is sealed and that the ground is pretty flat. Tip of a bio gardener. If you transplant cabbage on spot, place the plant then obliquely in a slot that you fill with compost and firly press and water. The plant naturally turns back (right) up. The larvae that enter near the stem die, they 'll find the stem, but not the roots. Beautiful and environmentally friendly misled. Four pieces of rhubarb around the newly planted cabbage stabbing in the ground would also help against cabbage fly. Since butterflies hate sage you can also put it between the cabbage. Bitter- (rocket- or land-) cress (Barbarea vulgaris) is a cruciferous (Cruciferae or Brassicaceae) whose leaves are edible. It is naturally resistant to certain insect species that are just specialized on crucifers. Against diamondback moth (Plutella xylostella) and flea beetle (Phyllotreta nemorum) are saponins effective. Glucosinolates (as glucobarbarin and glucobrassicin) act as a cue for egg-laying cabbage butterflies (Pieris rapae). The larvae of these butterflies thrive on landcress, but soon die by the saponins which apparently are not perceived by the moths.